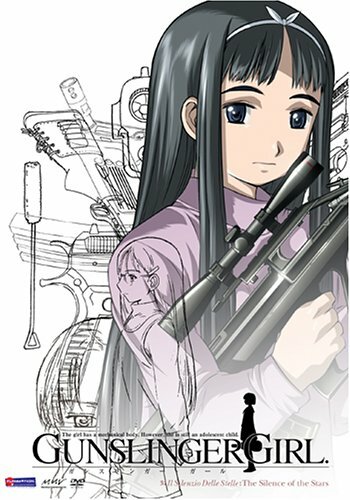 Offering Gunslinger Girl DVDs Gunslinger Girl Series Gunslinger Girl Books Gunslinger Girl Music and more with easy online ordering. The grizzly murder of a fratello gets Section One involved, with an investigator sent in to get to the bottome of the "cyborg problem." As the agency scrambles to protect their girls, Henrietta and Jose find themselves on an impromtpu vacation, having "been sent away for their own safety." What are they hiding? And what does Henrietta know about the deadly truth? Then the Agency uncovers a plot which could be used to wipe out the terrorists' stronghold once and for all. Things go terribly wrong, and in an all-or-nothing attack the girls find their lives on the line. Could this be the end of the girls and the Agency? Could their lives be over before they've really begun? Innocence Lost.... Henrietta barely survived a brutal attack that killed her family. "Rescued" by the Social Welfare Agency, her injuries were repaired with robotic components and she was brainwashed - lost with the memory of her family's death was almost every trace of her own humanity. Today she is an extraordinarily lethal cyborg assassin, obediently working with her handler Giuseppe to carry out her deadly tasks. Despite her conditioning and programming, Henrietta still has the heart of a young girl; she has not completely forgotten how to love. Yet the very emotion is contrary to her training and programming. Can the Gunslinger Girl survive? Can she find peace in a struggle against her very nature?